Earlier this month, we had the opportunity to visit our college girl at school on homecoming weekend. Ouachita Baptist University holds a special place in our hearts. My husband and I met there! Now our oldest is a Ouachita Tiger! Treats for OBU Homecoming HAD to have a tiger theme! Tiger Tails were easy to make and yummy to eat! First, thread three marshmallows onto a bamboo skewer. Dip the marshmallows into the melted candy. I actually had to spread the melted candy on my marshmallows. Just be sure you get a little of the candy on the bamboo skewer and the under-side of the bottom marshmallow. If you don’t, the marshmallows will slide down the skewer. While candy coating is still wet, sprinkle with orange sugar for extra fanciness. Stick the coated marshmallows in Styrofoam to dry. If you ever let your children use your sprinkles, you can expect cross contamination of colors. I had to pick out all the blue sprinkles. I think this was pay-back for the time I had them separate sprinkles for me. Melt some chocolate chips in a zip top bag. Once melted, clip the corner of the bag. Drizzle the chocolate back and forth over the orange “tails”. Now they really look like tiger tails! Just don’t twirl the skewer. I tried it. The stripes looked like a spiral not a tiger. Carefree and unstructured is the way to go. Of course I had to use cellophane wrappers to make them look more professional. I thought this would be a good opportunity to practice my decorating skills a little, too. I packed up the treats in an old purple Easter basket, handle removed, with yellow shredded copy paper. I needed the paper shreds to cover the foam in the bottom of the basket necessary for the tiger tails to stand. I happened to have a big cellophane bag that could house the basket and a big purple bow! Perfect! The tiger tails were a hit! She even shared with the roommate and suite mates! Today’s lunch was “smorgasbord”. Smorgasbord at our house means move all the leftovers from the refrigerator to the counter–cafeteria style.We have it at least once a month-typically either Sunday or Monday. You see, the garbage man comes on Tuesday. This is the perfect time to clean out those containers that have “science experiments” growing in them. We always have lots of choices. Everyone goes through and picks whatever he or she wants to eat. We have to eat in shifts though since we all have to wait to use the microwave. Today, Katie had butter noodles-leftover spaghetti from Spaghetti and Meatballs. Megan had the rest of the Tuna Stir-fry–stay tuned for that one! Chip used some of the leftover brisket to make quesadillas. I picked through the remains of a bagged salad and used up the last piece of fajita chicken. In an effort to use up even more leftovers, I grabbed a container of fried apples to use for our dessert– Apple Flautas. There is nothing fancy about these apples. They are just fried apples from a can. I was almost able to use up the last of the tortillas, too! I’ve never made Apple Flautas. I didn’t even bother looking up a recipe. Mom used to get them from Schwan’s when we were kids. Too bad they don’t carry them any more. While assembling my Apple Flautas, I had a little vegetable oil heating in my pan. Of course, if you have a deep fryer that works great, too. I spread a little butter on my tortilla, then added the apples. The canned fried apples were already sweetened, so I didn’t add any extra sugar. I did, however, add a little cinnamon. In the picture below, you see that the fruit is in the middle of the tortilla. I realized after I took the picture that that would not work. I turned the plate and scooched the fruit to the bottom 1/3 of the tortilla. See now why the fruit needs to be on the bottom 1/3?! If it is right in the middle, you don’t have anywhere to go when you are rolling your tortilla. Fold in the sides of the tortilla. This helps hold the fruit inside the tortilla while frying. Yes, do this to both sides. I could only fold and hold one side while I took the picture. Continue rolling up the tortilla. I placed my rolled apple flautas seam-side down in the hot oil. It seemed like they would hold together better that way. Cook until golden. Flip the apple flautas over and cook the other side. I also held them on their sides to get the browning all the way around. If you are using a fryer you don’t have to worry about this. **Note: You need to turn the heat down a little on the second batch. I turned mine down, but I guess it wasn’t enough. With the pan and oil already hot, the second batch browned up A LOT faster. Just so you know! Look! Another leftover item from the fridge! This caramel dip is so yummy! Caramel is my favorite topping! There is just something about the rich, buttery flavor of caramel. I added a few more apples on top along with the caramel sauce and vanilla ice cream and a little shake of cinnamon/sugar. I would have used a bigger scoop of ice cream, but we finished it off, too! There was barely enough to go around. There you have it. 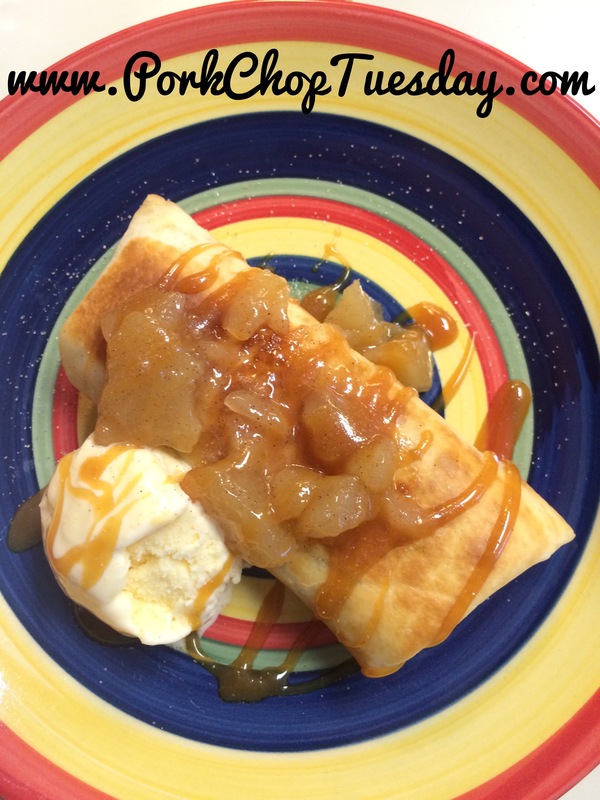 Apple Flautas! Not bad for leftovers. Chip: Like an apple chimichanga with ice cream on the side. I really liked it. Megan: I thought it was really, really good but needed more filling. Katie: A wrapped up bundle of awesomeness! When life gives you rotten bananas–make banana bread! Okay, that doesn’t flow quite like the lemons to lemonade quote. The only time life has given me rotten bananas was the time the grocery store bought too many. They were selling bags of black bananas dirt cheap! We buy bananas on a fairly regular basis around here. Folks like them in cereal or smothered in peanut butter. When they start to go to the “dark side” I usually chop them up and freeze them for smoothies. Sometimes I squish them up and freeze them in a baggie. Usually, they get black and leaky and I end up throwing them away! Wasteful! Peanut Butter Chocolate Chip Banana Bread! I made it to eat for breakfast. The kids ate it as a dessert and a snack. The loved it! Spray the bottom of a loaf pan with cooking spray. Combine flour, sugar, baking powder and salt. I find that using a whisk to combine dry ingredients works well. Add bananas, milk, peanut butter, oil and egg. Stir until moistened. Sprinkle chopped nuts and the rest of the chocolate chips on top of the batter. I press the topping into the batter a little. Bake about 60 minutes. After checking with a toothpick, mine took a bit longer. Cool in the pan 10 minutes. Loosen sides from pan-remove to a cooling rack. Cool completely. Chip: Simply fantastic. I’ve always been an advocate for putting peanut butter on bananas. This bread does it for you — plus it has chocolate, too. Megan: If this stuff was illegal, I would be incarcerated. Seriously-it’s that good!